Navigating the PX360 is a breeze with the new Colour Touch Interface. The 5.3-inch full colour touch screen responds immediately to your touch, incorporating familiar icon styles and gestures such as swipe. 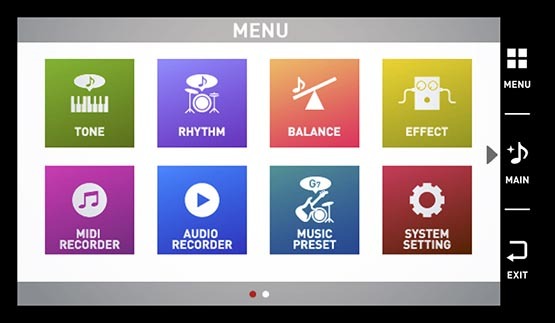 The intuitive touch screen ensures every function, from choosing tones and rhythms, to effects and recording are always right at your fingertips. The PX-360 features Casio’s renouned Tri-sensor 88-note scaled hammer action. Just as on a grand piano, the lower notes feel slightly heavier, and progressively become lighter towards the higher notes. Both beginners and seasoned pianists alike will appreciate the feel offered by the ebony and ivory textured keys, ensuring maximum grip on the keys. Casio PX360 Privia Series has unique action called 88-key Tri-Sensor Scaled Hammer Action II which has same size and action as an acoustic piano and with lower keys heavier and becomes lighter as keys get higher. Casio PX360 Privia Series 88 has an ivory feel keys which prevent fingers from slipping, gives prestigious look, and instills cleaner feeling. Casio PX360 Privia Series has three sensors on the key that allows users to feel detail when controlling strength and even has an option that allows velocity and responsiveness control.